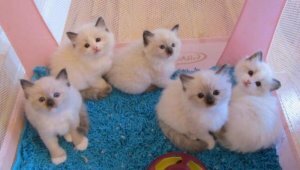 Our littler of Ragdoll kittens are ready for their loving homes today. They are so cuddly and cute that I really donot wana let them go to their new homes, however, I can not keep them all sadly. They are deflead and dewormed just to prevent any fleas and for a stable diet. They eat wet and dry food and if you need some Free food packs we have extras. We have been feeding them very nutritious kittens wet and dry food for healthy living. We prefer to use good quality litter for hygiene and to avoid any infections which sadly is common. I have some FREE spare bags of hygiene litter for your ease. If you would like to rehome any of our bundles of joy please email us .